Compliment your home with a complete home-landscape-plan and create an atmosphere for your outdoor living space or a specific look for your home. Hi my name is Dave and I have been involved in the green industry for the last 28 years. During that time I have had to deal with a variety of specific problems, and needs required by my customers. You can save yourself a ton of headache, and become a landscape expert by utilizing my experience, ideas and design solutions. This home has nice curb appeal. 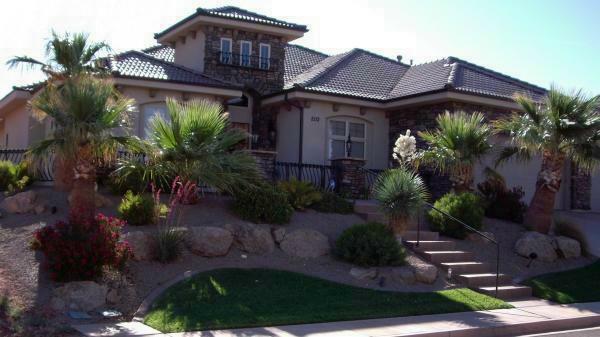 Curb appeal, is a term I first heard during the parade of homes in 1992 here in St George, Utah. That's the award we won for the landscaping we installed on one home here. Curb appeal is created with an eye catching combination of architecture and complimentary landscaping features. It also is inviting to a visitor. Night time and evening curb appeal of a home or landscape is enhanced with creative landscape lighting. Up-lighting the trees and corners of the home and entry points, helps the potential guest see where the entry is and get a feel for the layout and architecture of the home. There may be problems specific to the shape or location of your property which will need to be addressed. Maybe you will have a drainage problem that needs to be handled or possibly your home-landscape-plan will need to incorporate a plan to retain a hillside, or create more usable space for a patio. Or possibly you just desire a specific look of landscaping to fit with your home. If a swimming pool or water fall is a desire, planning ahead before landscaping to provide infrastructure for the drainage, grading, plumbing, and power required for this will need to be addressed. Additionally, fencing, and access will be an issue if you have a body of water. A landscape environment needs to mimic nature in order to create emotion? Incorporate different home-landscape-plan features such as (patios, lighting, drainage, rock, fencing, water features and fire) together with plants trees & lawn, so you can create an environment that looks, feels, and sounds natural. These ideas and concepts implemented corectly can make your yard the envy of the neighborhood. Select one of the buttons on the left margin above or one of the highlighted links at the bottom of the page, to get you to an area of this site specific to your needs. front-yard-landscaping-ideas and photos to create curb appeal for your home. photos and design examples of building-a-fire-pit into the landscape design. 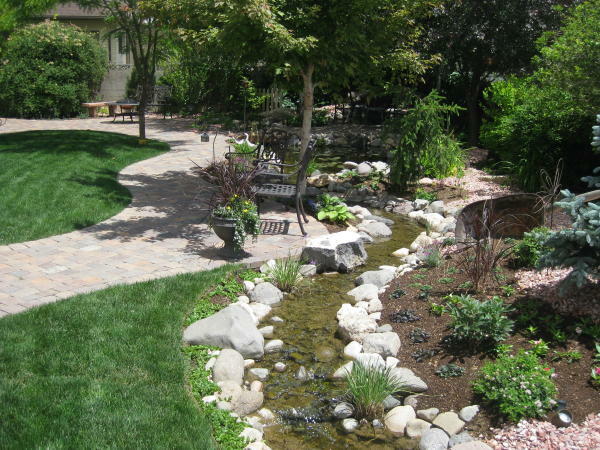 backyard-landscaping-ideas that incorporate water features, and patios, to create an oasis retreat at your home. The use of outdoor-patio-lighting with malibu lighting or solar lighting to add security to the landscape and create a beautiful evening atmosphere. Exciting patio-ideas for outdoor living. ideas-for-landscaping-a-hill that incorporate landscape drainage and asthetics into the plan. 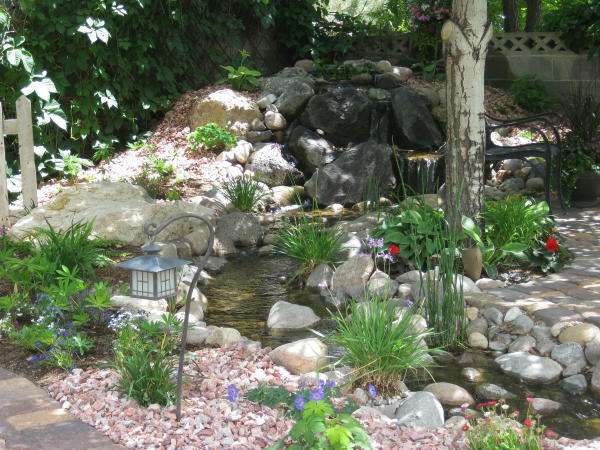 Using outdoor-garden-water-fountains to create a peaceful flower garden. Photos showing how incorporating an outdoor-fireplace with unique fireplace tile designs and a good fireplace mantle design, will make more decorative outdoor living space. Photos and ideas about landscaping-planning to combine your desired landscape features with the functionality of the yard. 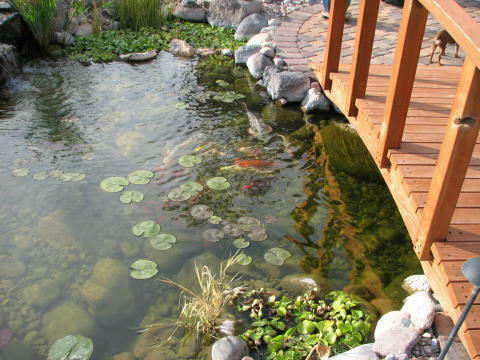 build-a-fish-pond and bring life to the landscaping. Using landscape-design-plans to show placement of landscape elements such as backyard patios, hot tubs, lawn areas, planter areas.and irrigation design. photos of outdoor-kitchen-plans that incorporate the barbeque into outdoor counter space with storage and a nice tall table top. Ideas and solutions for dealing with landscape-drainage in your yard. flower-garden-ideas to create a relaxing atmosphere. Using landscaping-bushes to soften the edges of a landscape and draw the eye to a specific area. Using a stone-bridge in your landscape design. Photos and descriptions of how-to-build-a-fence that takes care of your needs. Controlling the garden area with garden-grow-boxes. Create a hot-tub-landscaping atmosphere with landscaping..
Ideas for how to use garden-statuary-fountains to decorate outdoor flower gardens and water gardens. desert-landscaping-ideas for a colorful landscape. The use of different types of landscape-trees in the landscape design. Using desert-plants for their unique textures and colors. Considering landscape-maintenance and cost when designing a yard. Would you like to share your knowledge about home-landscape-plan? Great, find out how you can submit your story or tip here.